The reason I kept the order instead of cancelling it is this support document, which states that the 5k Ultrafine Display will work on older, Thunderbolt 2 machines with an adapter, but at a resolution of 4k. 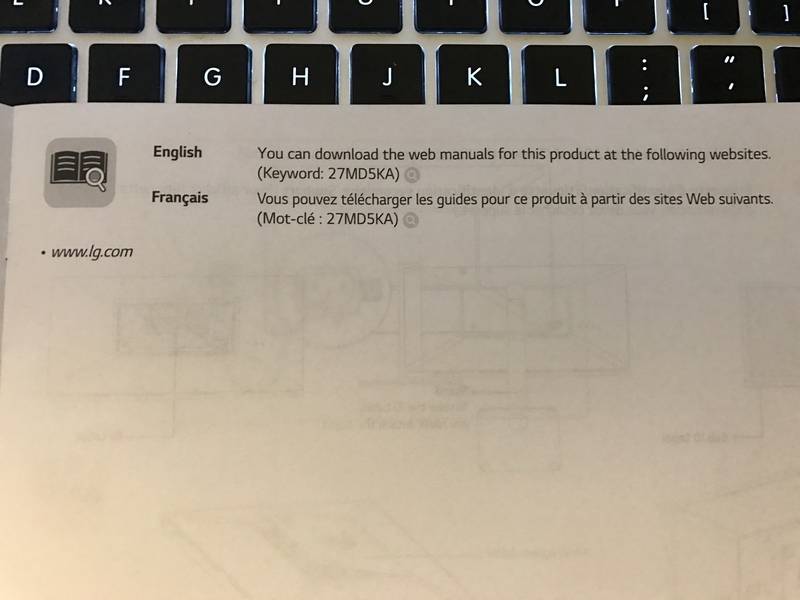 I have a 2013 Retina MacBook Pro, but Apple states that a 2014 MacBook Pro or higher is required for the display to work at all. My hunch was that Apple was being conservative. The 2013 MacBook Pro I use is identical to a 2014, which was just a minor CPU speed bump. So for this review, I’ll be doing something a little unusual, and using the display with something outside the support range. 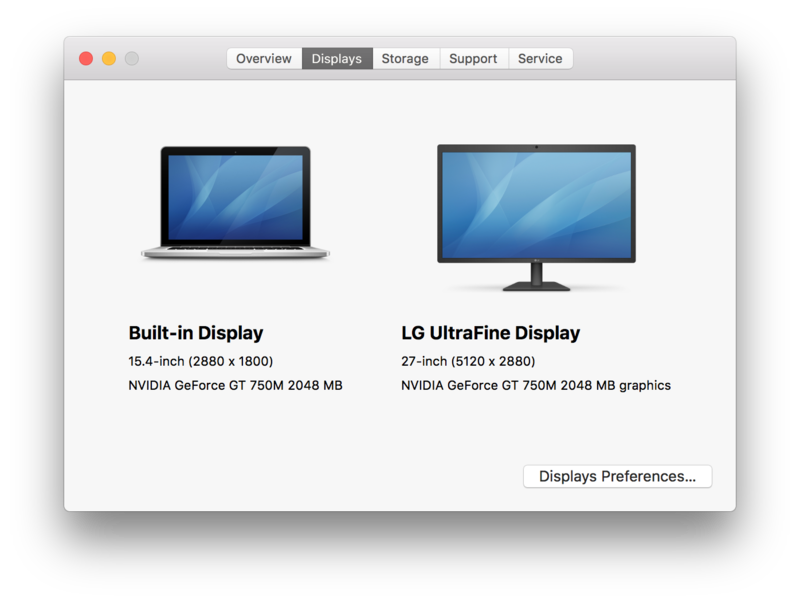 I picked up the Thunderbolt 3 to Thunderbolt 2 adapter, and hoped my MacBook Pro would be able to drive this display. Spoiler: The display does work on other Thunderbolt 2 Macs, but Apple has done a few interesting things for older Macs. More on that later. I was surprised at how large the box was. The Ultrafine box felt bigger than my Thunderbolt Display box. There were pretty obvious signs that this wasn’t an Apple product. The display was wrapped in a foil textured sort of wrap instead of the soft paper Apple uses. And the display very unhelpfully came with an Energy Star sticker pre-applied directly on the screen, which was at least easy to peel off. I’ve only bought Apple displays (with a display I borrowed for a gaming PC being the only exception), so the noticeable decline in packaging quality was bittersweet. The monitor does work with Apple’s built in software as advertised. There are hardware controls or settings, but you can change the brightness and use the speakers and webcam from macOS out of the box. There is also an ambient light sensor which my Mac found but would not enable. LG does have a second set of drivers you can install that enable things like window snapping behavior. They’re “If Steve Jobs Was Alive For This Partnership He’d Be Calling LG on the Phone And Chewing Them Out” awful. There is a lot I could say about them, but I think the pink menu extra they stick in the menu bar says enough. The look and feel of the hardware itself is… surprisingly decent! The pictures online make it look really awful, but in person it’s not so bad. The panel is still glossy, but not covered by glass, similar to the pre-unibody MacBook Pros. It’s actually a cleaner look than Apple’s displays, even though I liked the security of having glass protecting my display. The stand offers a larger range of motion than the Thunderbolt Display. Not only can the display tilt up and down, but it can be vertically adjusted to a different height. For unclear reasons, the display can also be rotated left or right by several degrees. At first, I thought this was a quality issue, but the manual notes this as a “horizontal adjustment” feature. This feature, combined with the height adjustment, definitely makes me feel more uneasy when I move this display. With Apple displays, the build quality of the whole display always made me feel guilty about swapping out the Apple designed stand with a display arm, but I’d have no such hangup here. The stand for the monitor is decent, but not amazing. Helpfully, the display does come with a VESA mounting bracket, whereas for the Thunderbolt Display it was a separate purchase. As I mentioned at the beginning, my setup was a little more complicated because I’m using a Thunderbolt 2 Mac that normally supports 4k output. Thunderbolt 2 does not have enough bandwidth to push a 5k image, which is why Apple had to wait for Thunderbolt 3 to release an external, 5k Thunderbolt display. This is also the cause of Thunderbolt 2 Macs only being able to push a 4k image. Thunderbolt, like Firewire before it, is backwards and forwards compatible. The protocol remains the same, even if the devices are getting faster and faster. 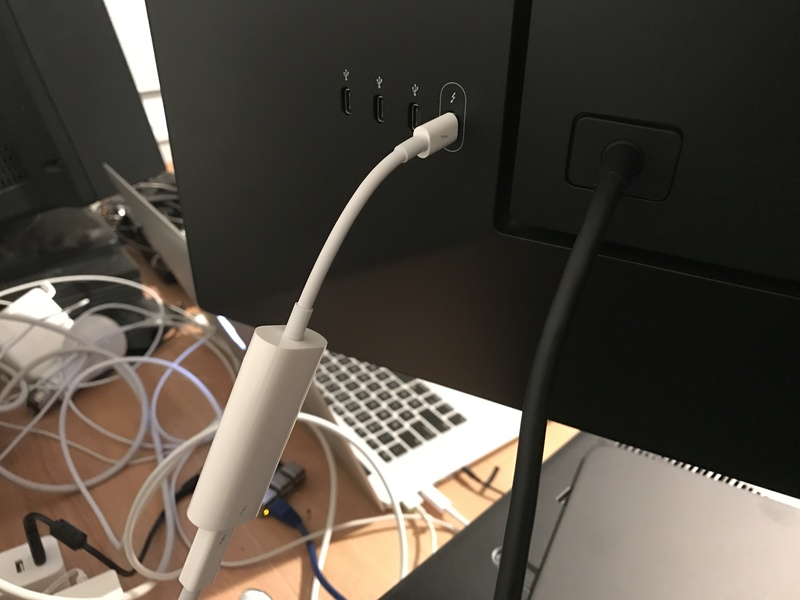 Normally you would plug the Thunderbolt adapter into a computer with Thunderbolt 3 to use a Thunderbolt 2 device. But you can actually do the opposite as well. If you plug the adapter into a Thunderbolt 3 device, you can plug the device into it a Thunderbolt 2 computer, albeit at running the device at Thunderbolt 2 speeds. Below is a picture of the Thunderbolt 3 adapter plugged into the back of the display. It’s a little odd to plug the adapter into the device instead of the computer, but it’s how Thunderbolt is designed. A few more notes on connecting this thing up to other devices: It is a Thunderbolt 3 only display. This means you cannot plug it into a non-PC device like a game console. You also cannot connect it straight into a GPU right now, which makes it more difficult to use with things like external GPUs. And it is a Thunderbolt 3 device and not a USB-C device. This display will not work with USB-C only devices like non-Thunderbolt PCs and the 12″ MacBook. It also will not work with non-Thunderbolt devices like the 2012 Mac Pro or earlier Mac Pros. The 4k version of this display is actually a USB-C device, not a Thunderbolt device. So if you have a USB-C only machine like the 12″ MacBook you can use the 4k model. Standard USB is not forwards compatible to USB-C as far as I’m aware, so a downside of the 4k display is there is no way to make it work on an older Mac that does not have USB-C. When I flipped open my MacBook Pro, the display came to life. So the 5k display will work with any Thunderbolt 2 Mac, not just the one’s in Apple’s support document, as long as your Mac supports 4k output. To be sure I wasn’t losing my mind, I went to System Profiler, and got a different answer. The display looked too good to be 2560×1440, but I also knew the display couldn’t be rendering at 5k. A quick test app written in Xcode also revealed that the display was rendering at 2x Retina scale. So what was going on? I downloaded SwitchResX which revealed something very interesting about how Apple handles the LG Ultrafine on older Macs. Apple is rendering the screen at 5k, but then downsampling it to 4k and sending it to the display. So my computer acts as if it is attached to a 5k display, even though it can push a 4k image. That’s a really clever enhancement that almost makes this display worth it for older Mac owners. 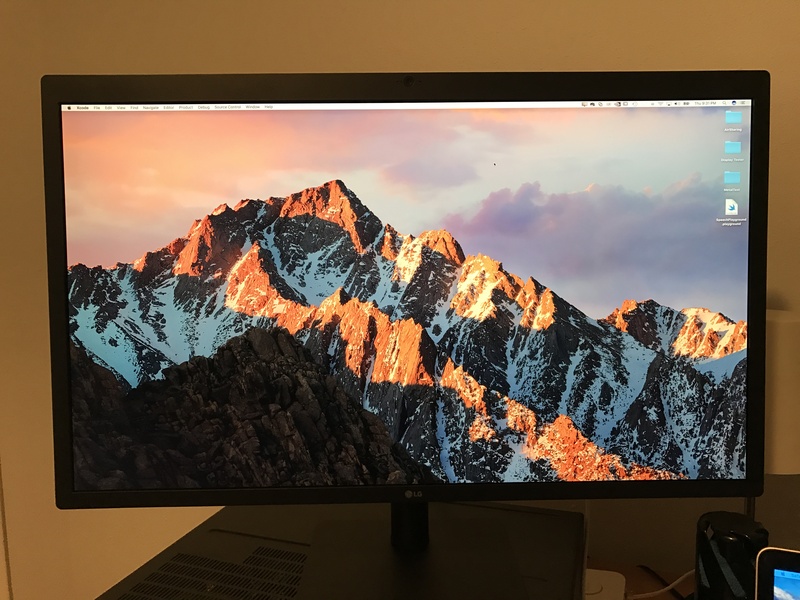 Even with only 4k output, it could be a great drop in replacement for an Apple Thunderbolt Display, with a noticeable increase in image quality and P3 support (with a bit of help from SwitchResX.) Apple has clearly thought about the Apple Thunderbolt Display sized hole that is being left in their lineup for Macs that haven’t rolled over from Thunderbolt 2 yet. There are only a few catches that could prevent this from being a complete Apple Thunderbolt Display replacement. My MacBook Pro would no longer sleep while the display was connected. And Apple notes machines like the Mac Pro might not have access to pre-boot menus like the boot drive picker. This display looks really great from the moment it blinked on. I verified my MacBook Pro was doing P3 output by loading up this page of example wide gamut images, there were clear differences on the display between the RGB bit and P3 bit images. The Ultrafine 5k is also advertised as a display capable of 10 bit color. My MacBook Pro default to 8 bit, but SwitchResX did have an option to switch to 10 bit color. Unfortunately after some time in Photoshop fiddling with settings, I could not get anything that looking like 10 bit output out of Photoshop. Doing the math, I should barely have enough bandwidth to output 10 bit color, but it’s also possible my GPU is not capable of 10 bit output. The colors seemed brighter and more well defined than those on my Thunderbolt display. The color temperature is a hair warmer than the one on my Retina MacBook Pro, but it was only noticeable side to side. I’m a developer looking for a Retina doubled 2560×1440 display, so it wasn’t something I had any critical thoughts on. Black levels are where this display might have some weakness. When displaying things like a pure black window fullscreen, there was some minor flash lighting in the corners. (Flash lighting is when the corners of the display are brighter than the rest of the display.) Most computer displays have this problem, including the Apple Thunderbolt display that came before. It’s also a rare situation for a computer display to have to deal with. The display is noticeably brighter as well, and is brighter than the panel in the iMac. Turning down the brightness solved the flash lighting problem, at the expense of the amazing vibrant colors. I’d rather take the brightness and deal with the minor flash lighting. Overall, I didn’t see any huge problems with image quality, and being able to display such a high resolution is a clear win over the Apple Thunderbolt Display that preceded it. There are only three USB-C ports on the rear (which I’m assuming will not run full speed when using a Thunderbolt 2 adapter.) This is a downgrade from the Thunderbolt Display which also had three USB 2.0 ports, and Firewire 800, Ethernet, and another Thunderbolt port for daisy chaining. Throwing an ethernet adaptor onto the display means losing another USB-C port. I would have preferred another USB-C port or two, even if it couldn’t be guaranteed they’d always all run at full speed at the same time. I was hoping whatever came after the Apple Thunderbolt display would have a headphone jack. Still waiting. Some of the issues around ports could be solved by using a Thunderbolt 3 dock, but I don’t know how well the display will work daisy chained to a Thunderbolt 3 dock. The speakers sound good, but they’re crazy loud. It would be nice to see an update that re-calibrates the maximum volume setting. I miss the nice, clean speaker grate at the bottom of the Thunderbolt Display. The Ultrafine just has some gaps for the speaker. But you also won’t spend time looking at the bottom of the display. The webcam is 1080p, but still seems noisy much like the Apple Thunderbolt Display webcam. Like the Apple display, there is a green light that lights when the camera is in use. The layout and “active” light actually looks suspiciously identical to the Apple Thunderbolt Display. You can also use the webcam audio as a macOS audio input source. It’s 24 bit and 48kHz. If you have a Thunderbolt 2 Mac, you won’t get charge from the display, because that’s a Thunderbolt 3/USB-C only feature. Does it work with Windows? I don’t know, but I plan to find out if we don’t see a good desktop strategy from Apple/Mac Pro this year. I don’t see any reason why it wouldn’t work, but I’m also prepared for selling this display on Craigslist if it comes to that. Speaking of Windows, I have found no sign that this display supports FreeSync or Nvidia’s G-Sync. Some LG displays support FreeSync, but I don’t have any AMD hardware to test that on with Windows, and I wouldn’t bet on the support being there unadvertised anyway. For pure gaming you might want to look at a different display. The display is supposed to support 10 bit color. By default, macOS sees it on my 2013 MacBook Pro as an 8 bit color device. I can switch it to 10 bit with SwitchResX, but I still see 8 bit gradient banding in Photoshop, even with settings adjusted. I’m not sure what the issue is, but it’s also very likely my older MacBook Pro cannot do 10 bit output. Would I recommend this display? If you want full macOS support, maybe a better question would be if you even have a choice. It’s a clear upgrade over the Thunderbolt Display. If you liked the Thunderbolt Display, and you’ve accepted you’ll need to move on from Ive designed Apple displays, I think you’ll be more than happy with this display. There are alternatives. Dell has a 5k display which has more input types, which might be a better choice if you have many different kinds of devices. But for me, I wanted a 5k display that acted like an Apple display, and the Ultrafine mostly fits the bill, especially if you ignore the horrible LG software. Even running at 4k on my older Mac, it looks excellent, and I’d have no problem recommending it to someone who is buying a current Thunderbolt 2 Mac Pro. This display at 5k with a Thunderbolt 3 Mac Pro could be a really killer combination. Here’s to hoping Apple will deliver the Mac Pro part in 2017. Hey, I’m exactly in your spot. Having a Mac Pro 2013 and wanna upgrade my TB Displays. You’re saying it works fine. Could you post some detailed close up pictures or send them via email to me? I need to know if the 1440p through the adapter solution looks similar to a 1440p scaled mode on a true 4k display like my dells are. Is it not washed our or blurry at all? It’s hard to believe. Please, your help would be very much appreciated, as I have no way to check out these displays for myself somewhere and delivery times in Germany are still 6 weeks out, while I need to make a decision on these dells within 14 days now.